It is 1198 km west of Buenos Aires, so it takes 1h 40min by plane or 12h by car from Argentina’s capital. It is at the base of the Andes Mountain Range (Cordillera de los Andes) and close to the Chilean border. Its altitude (700m), weather and irrigation system (which capture water from the mountains) make it an ideal area for vineyards. 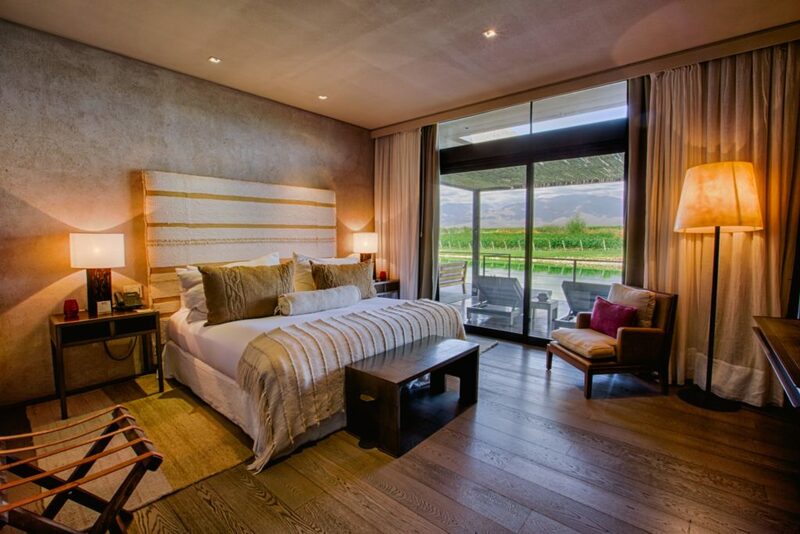 This is our selection of wine hotels in Mendoza. 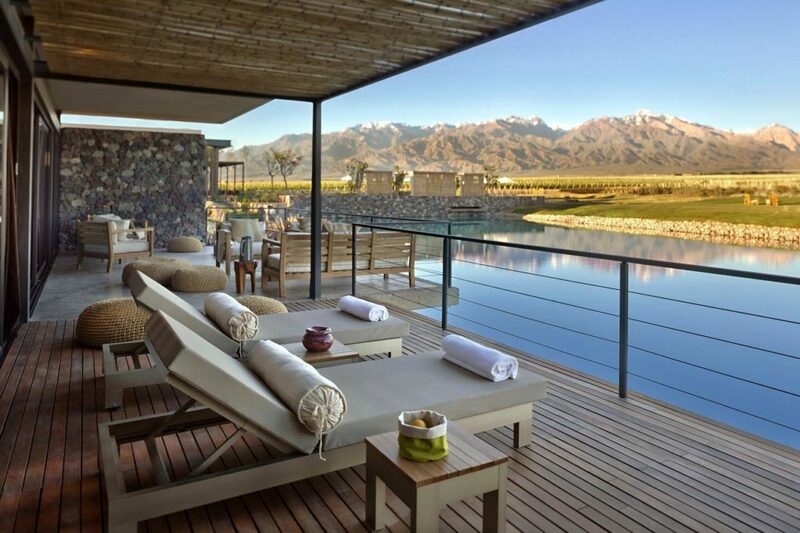 Cavas Wine Lodge is the first luxury wine resort in Argentina and it still remains predominant. Its rooms may not be as modern and stylish as the other (and newer) hotels, but the success of Cavas is in the staff and the attention to detail in every aspect of. It also holds the best reviews on all major online websites. The staff is excellent, helpful, friendly and attentive. Most of the hosts declare that the staff make a huge difference, making you feel at home every time. Is it set within a 22-hectare estate at the foot of the Andes, with a splendid Spanish colonial-style boutique hotel. It comprises 18 rooms, including luxury ones and villas. Some of the facilities include private bathtub and pool, fireplace, terrace, coffee machine and more. The breakfast is delicious and offers buffet and a la carte items as well. The spa offers a menu of treatments based on the use of vine and grape seed extracts. The restaurant offers international and Argentinian cuisine (empanadas, chimichurri and humitas, stake, etc). Its chef, Mariano Gallego, use vegetables from his own garden. Prices are around 50-60 USD. And cooking classes are also available. Other activities include horse riding, bike and walking tours, live music, themed dinner parties, tango evenings, birdwatching, hiking and 9 holes golf. 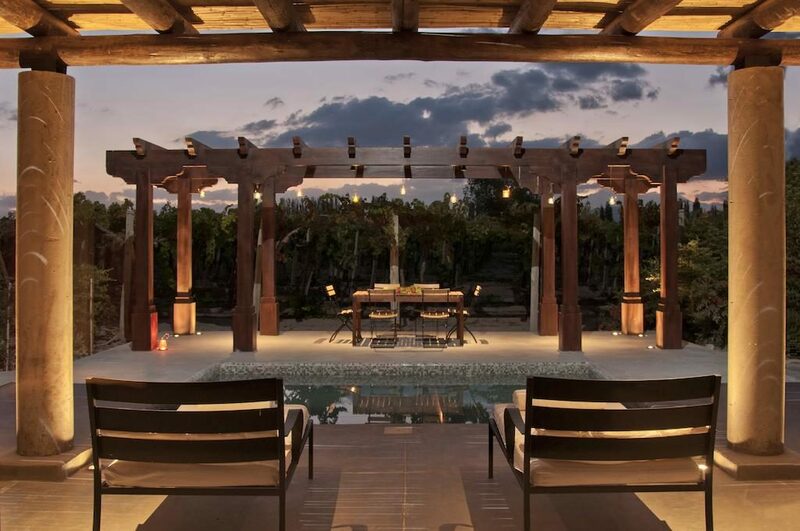 The Vines Resort and Spa is also located in the Uco Valley, the most popular wine area in Mendoza. They offer a large list of activities besides wine tasting, including picking, sorting and crushing grapes (during the harvest season), horse rides at sunrise with local “gauchos”, yoga and fitness sessions, massages, blending wine classes and more. There are two important highlights of this hotel. One is the offering of private vineyards. So you can live the dream of having a vineyard of your very own, and making wines to share with friends and family. Wine lovers have the chance to become winemakers by owning a 1 – 10 acre of professionally managed Private Vineyard. The second highlight is being homed of one of Francis Mallmann’s restaurants. Its name Siete Fuegos, or “seven fires,” describes the chef’s honed collection of open-flame cooking techniques, inspired by Argentine gauchos and European migrations, and refined through hundreds of years of history. “Savour the rustic, fiery flavours of specialities like 9-hour slow-grilled rib eye, cast-iron baked salt-encrusted salmon, grilled seasonal fruits, and more, paired with award-winning boutique wines.” They also have options for kosher guests (reserve in advance) as well as vegetarians and vegans. 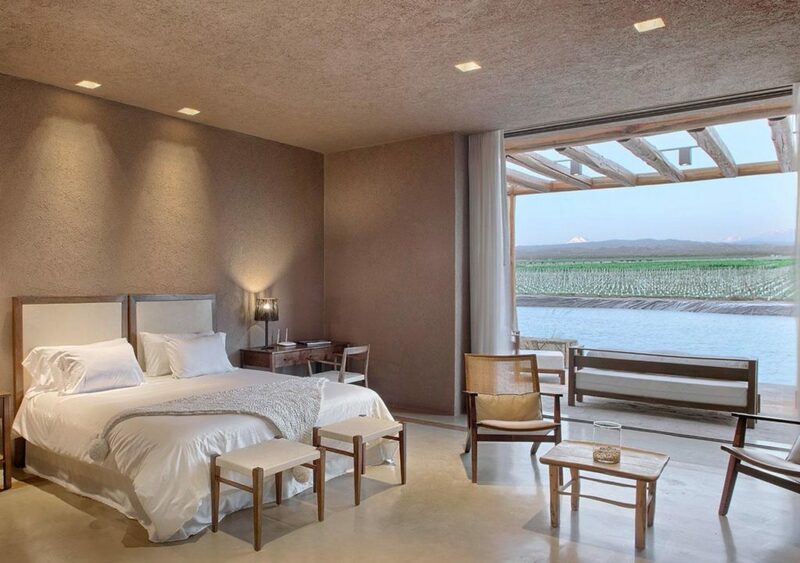 Rosell Boher Lodge is one of the newer and best wine hotels in Mendoza. 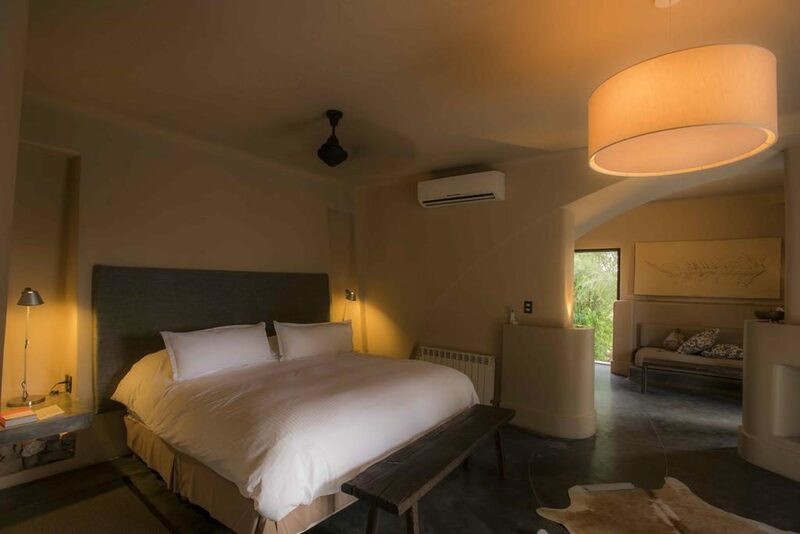 It is located in Agrelo area, surrounded by vineyards and facing the stunning Andes Mountain Range (Cordillera de los Andes). It comprises a large guest house with four luxury rooms, as well as three boutique bungalows (Villa), each with their own jacuzzi and firepit. All of them with breathtaking views of the Andes from every angle, and spacious outside seating areas. There is also a lake/pond adding detail to the overall view. The central area is also spacious and peacefulness. You can enjoy gourmet food, including lunch and a three-course dinner. And of course, you have a great wine selection as part of the tasting. I would recommend trying their sparkling wine as well, which is produced from Chardonnay, Pinot and Meunier. 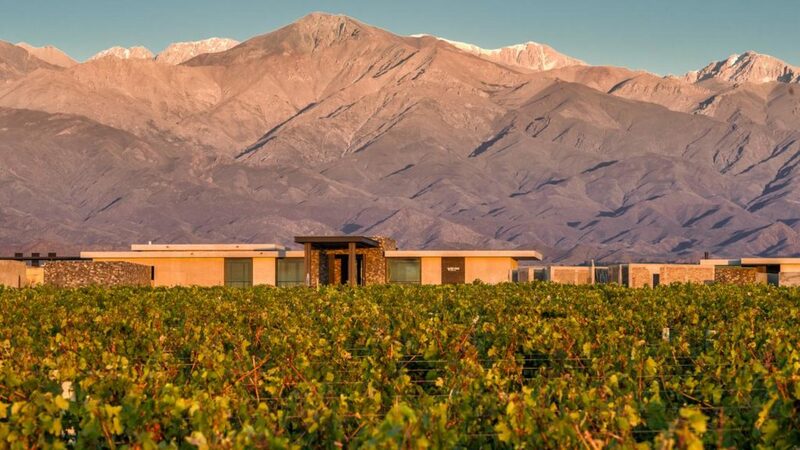 Located also in Lujan de Cuyo, and facing the imposing Andes, this winery offers a full experience of all aspects of vineyard life. 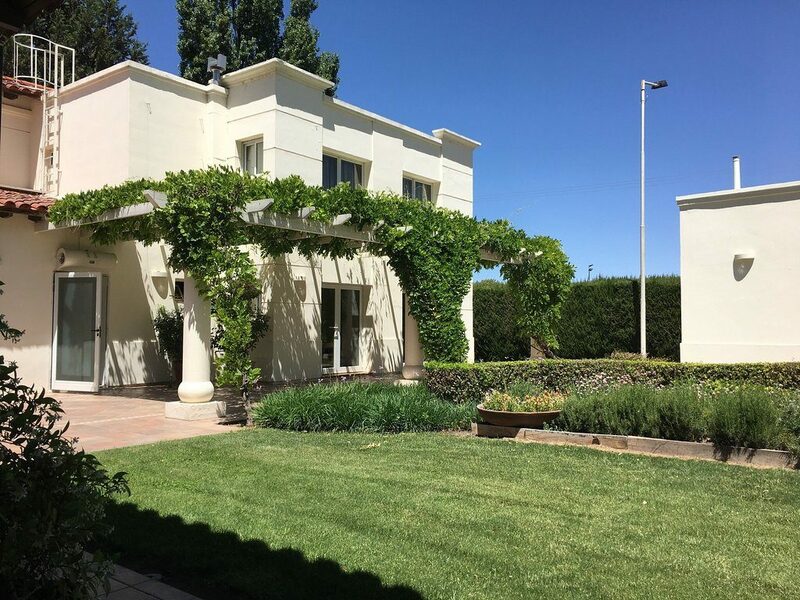 This centenary restored Spanish-style winery offers guided tours (regular and private), traditional Argentinian cuisine paired with their finest wines, cooking classes and a guest house. The staff is friendly and informative, and the posada is in a garden surrounded by nature. 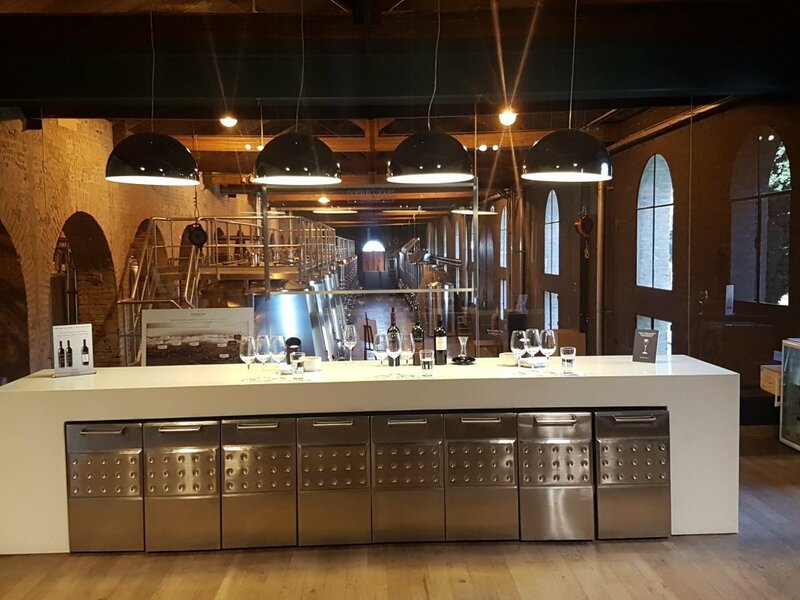 Their tastings and tours range significantly in cost, so make sure you understand what you are buying. It is owned by the multinational Moët & Chandon, one of the world’s largest champagne producers (also part of Louis Vuitton Group). So take the opportunity and try their sparkling wine (Chandon or Baron B). 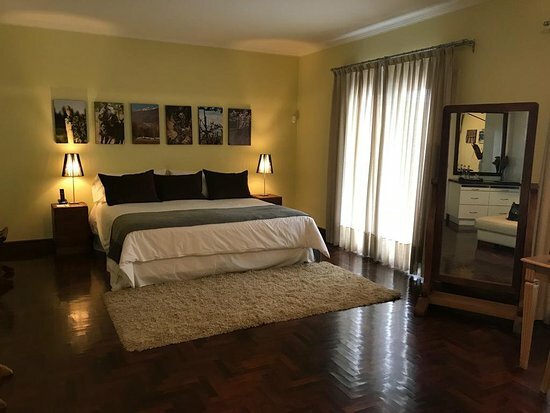 There are 6 rooms (4 twins and 2 kings) in the guest house, each decorated in an exclusive style inspired by their varietals: Malbec, Cabernet Sauvignon, Syrah, Merlot, Petit Manseng, and Torrontés. Rooms are not available on any booking website and need to be arranged by contacting them directly. For a good selection of value Malbec wine, visit “Best value Malbec wines from Argentina“. If you go to Buenos Aires, check our post “Best cool and quirky restaurants in Buenos Aires“.